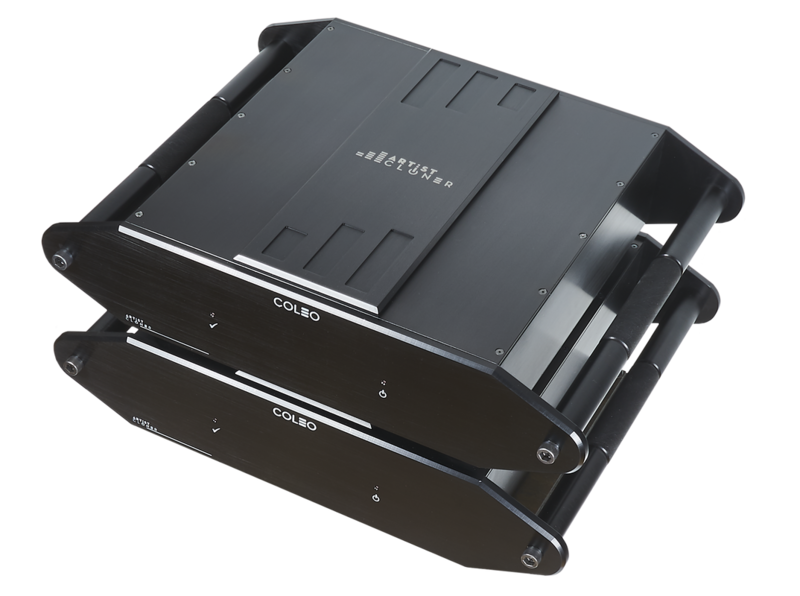 The COLEO mono block amplifier is the result of working on the evolution of a design. Striving to get the simplest amplifier circuits to work while being stable is not an easy task. What has been accomplished here is an amplifier that has a high resolution capability, rhythm and pace that feels so true that it becomes difficult to have your attention on something else but the audio performance being unweaved. Room cues, reverb, the small details of lips opening just before the voice kicks in or the artist moving on their chair is all part of getting the feeling of being in the presence of the artist. The amperage delivery capability is very high supported by the 2ohm rating and keeps control of the drivers for a truly organic sound. The tight control gives this amplifier a fast attack signature that is truly lifelike. Signal contamination is kept to a minimum with *few components handling the input signal to output thus preserving signal integrity for a true to life experience. Have a listen and you may find that your search is over. Don't let your watts fetish stop you from auditioning these brawny sounding amplifiers. After hearing them you will question why you ever needed more power. Short signal paths and high current capability ensure the least signal degradation from entry to exit of the amplifier. Not many amplifiers can triple down their output capacity to 2 ohms. This alone indicates a pretty brawny amplifier and sounds like one too. The dynamic capability of this amp is well over 100 watts (typically measures around 115-117 watts@8ohms) and as such sounds much more powerful than the stated wattage. 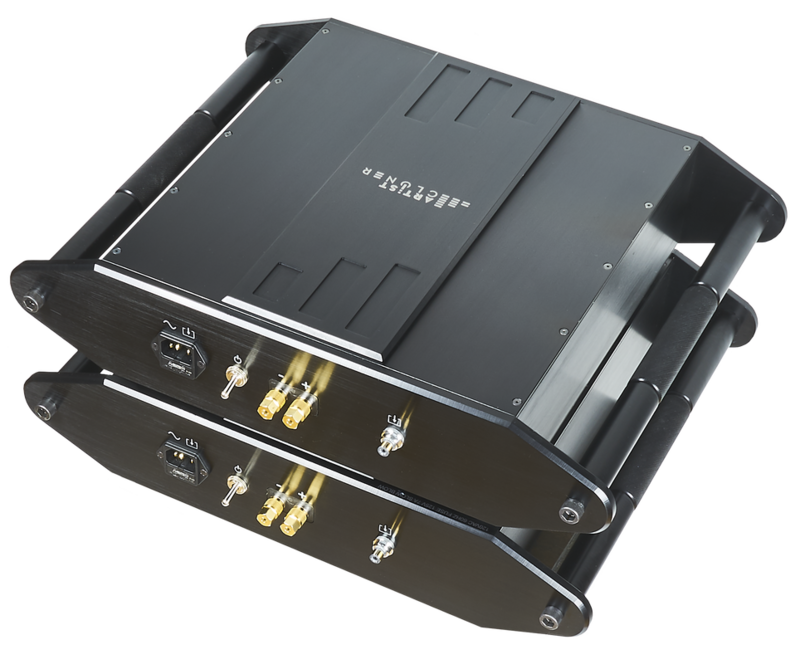 These amplifiers can amplify DC and as such ArtistCloner has integrated a DC protection circuit that monitors the speaker output for any DC present. This prevents the failure of speakers in the event that the amplifier, pre-amplifer or source (CD, DVD, etc) sends a DC signal that could cause damage is stopped by disconnecting the amplifier from the speakers. For as long and the fault remains present the system is protected. When the DC fault is no more present, the system resets for normal operation without having to shut down the amplifier. Normal operation is indicated by the check mark indicator on the front being illuminated. When the check mark indicator is not illuminated this indicates that DC is present and at a level that would probably damage your speakers. These amplifiers are designed to be on 24 hours a day with a very low standby consumption of approximately 15 watts. The advantage of such low power draw means that they are always ready for the best listening sessions at all times. They are meant to be powered on all the time and as such the power switch is placed in the back of the unit to emphasis that there is no need of powering on and off daily. These units need 24 hours from a cold start to be at their best and by leaving them on they are at their peak playing capacity. The COLEO amplifier needs to work for some time before unravelling its entrancing performances. 200 hours is the recommended minimum of actual music playing or burn-in type signals. Break-in time: 75 hours (60%), 200 hours (90%), 500+ hours (99%). Once broken in, these units need to be on for 3 days from a cold start to sound their best and as such are recommended to stay on as they have a very low standby wattage requirement (+- 15 watts). The only time these should be shut down is power fluctuations or a lengthy periods of time where you know you will not be using these amplifiers such as vacations. ORDER BASIS; be aware that the delivery time if not in stock for your Artistcloner amplifier is approximately 45-60 days. No robot is assembling this amplifier and there are typically 64 man hours in North America to create these superb amplifiers. We stress test the amplifier for 75 hours (not counted in the 85hrs) and remeasure its performance. We will communicate with you (e-mail) at every stage of its creation if you wish until the amplifier is delivered to you. The 8 year warranty is date of manufacture. *few components - from input to output the series signal is handled by one resistor, one JFET and 4 output devices.